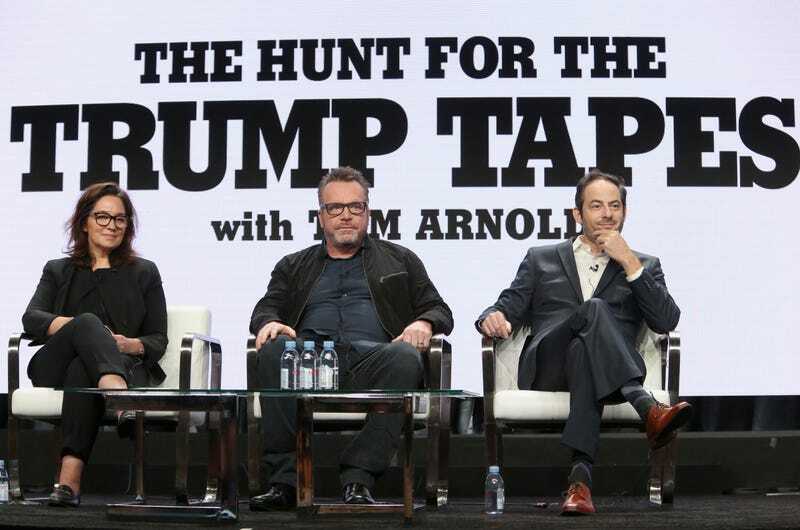 It seems fitting that in this incredibly dark timeline Tom Arnold would emerge as a self-styled citizen journalist, promoting a show where he’s not just playing detective (a crime procedural starring Arnold also sounds pretty dire, though). The Hunt For The Trump Tapes includes the search for the so-called pee tape as well as tapes from the set of The Apprentice, the reality-competition series Trump hosted until he was fired in 2015, in which the current president uses racial and ableist slurs. Arnold seems pretty convinced of the existence of these tapes, as well as their ability to oust Trump from the White House (we’re not nearly as optimistic, but at this point, we’re also dead inside). It’s why he’s sworn to hound Apprentice creator and chairman of MGM’s Worldwide Television Group Mark Burnett until he gives up the ones Arnold claims show Trump throwing out a racist epithet. Over the weekend, that pledge might have led to a physical altercation—Arnold tweeted on Sunday that he was choked by Burnett while at a pre-Emmys bash. According to Deadline, Alyson Hannigan saw the scuffle, which she says Survivor host Jeff Probst tried to break up. Touched By An Angel’s Roma Downey, who’s married to Burnett, tweeted a photo of what appears to be her bruised hand, and wondered if the scrape was worth it for Arnold. He fired back immediately with the threat of a lawsuit. Things got even weirder after the alleged fight, as Deadline reports that Arnold began “effusively” relating the encounter to people around him, as well as claiming that the Apprentice tapes had been “handed over to Ronan Farrow.” Arnold sought refuge with Patton Oswalt before tweeting that Kevin Bacon had somehow witnessed the whole thing. While we wait for Arnold to name-check another celebrity and for someone to hastily write up a script treatment, The Hollywood Reporter reached out to the actor-producer’s lawyer, who confirmed Burnett attacked Arnold. Oh, and by the way, The Hunt For The Trump Tapes begins tomorrow—a premiere we’re sure won’t be affected by these events at all. Update Monday, 3:01 p.m.: According to Variety, Tom Arnold has filed a battery report against Mark Burnett. The publication notes that security at the pre-Emmys event broke up the fight, and allowed both Arnold and Burnett back in after tempers had settled. Apparently, Arnold told Salon in an interview published hours before the party that he was going to “confront” Burnett at the Emmys.